The extremism of Canada’s support for Israel just keeps growing. Canadian diplomats held bilateral talks with various European countries and also pushed for Hizballah to be listed at numerous multilateral meetings. At both a recent United Nations Office on Drugs and Crime meeting and a UN conference on radicalization in Europe, Canadian officials pressed key EU officials to define Hizballah as a “terrorist” group (“Canada pushed EU to add Hezbollah to list of banned terrorist organizations, official says,” 24 July 2013). Canadian law enforcement and security officials were also part of the lobbying effort. Reportedly, they’ve been feeding their European counterparts information about the supposed threat Hizballah poses to both Canada and Europe. The Conservatives push to get the EU to list Hizballah was given a boost when six Israelis were killed in Bulgaria in July last year. Within hours of the bus bombing, Israel claimed Hizballah was responsible, yet more than a year later it’s still unclear exactly who committed this crime. With a Canadian passport holder allegedly implicated in the bombing, Ottawa jumped at the opportunity to get involved in the investigation. Presumably, Canadian investigators shared information with their Bulgarian counterparts designed to steer them towards the conclusion that Hizballah was responsible. In response to the EU listing its military wing as a terrorist group the Hizballah leader, Hassan Nasrallah, said: “Why don’t you classify the state of Israel as a terror state? Why don’t you classify Israel’s military wing … as a terror organization if you recognize Israel is occupying Arab lands and refuses to implement international decisions for decades now? The entire world bares witness to the massacres perpetrated by Israel” (“Nasrallah to EU: Why not brand IDF as terror group?,” Ynet, 24 July). Nasrallah raises an important point that Canadian foreign affairs professionals must be familiar with. It’s a simple fact that Israeli forces have killed far more civilians than the military wing of Hizballah. The Israeli military and its allies in Lebanon have killed thousands of civilians. In fact, Hizballah was created in large part to fight the Israeli occupation of that country. Israel has conducted scores of targeted assassinations in many countries across Europe, Asia and the Middle East. Certainly, Canadian foreign affairs officials must remember Gerald Bull. This Canadian engineer and designer of the Iraqi “supergun” was, according to CBC journalist Linden MacIntyre, shot dead by Israel’s secret service Mossad outside his residence inBelgium in 1990 (“Murdered by the Mossad?”, CBC The Fifth Estate, 12 February 1991). And what about members of the current Israeli government who support illegal settlersand the killing of dozens of Palestinian civilians? But apparently none of this “terrorism” bothers Prime Minister Stephen Harper’sgovernment. The Conservatives are either ignorant or relish their hypocrisy. Though they are allowed to support the Israeli military, Canadians can go to jail for sending money to a group operating a school or medical clinic in Lebanon “directly or indirectly” associated with Hizballah, which comprises an important part of the Lebanese governmental and social service structure. Dozens of Canadian companies sell to the Israeli army and many groups with charitable status promote the Israeli military. The Canadian Jewish News is full of advertisements for such groups: “Express your Zionism by serving as a civilian volunteer on an Israeli army supply base,” reads one ad. Another advertiser, the Libi Fund, runs educational projects for the Israeli military. Prominent Toronto couple Heather Reisman and Gerry Schwartz, who own or control more than two thirds of Chapters/Indigo/Coles bookstores, created the Heseg Foundation for Lone Soldiers. Reisman and Schwartz provide up to $3 million per year for post-military scholarships to individuals without family in Israel who join the Israeli army. After completing their military service these non-Israeli “lone soldiers” gain access to this scholarship money. For the Israeli high command (Heseg’s board has included a number of generals and a former head of Mossad) “lone soldiers” are of value beyond their military capacities. Foreigners volunteering to fight for Israel are a powerful symbol to reassure Israelis weary of Israel’s behavior. 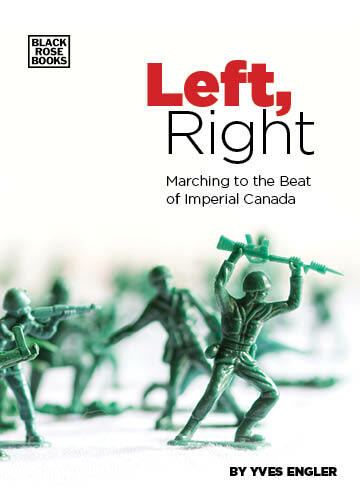 Schwartz and Reisman’s support for Heseg has spurred a campaign to boycott Chapters/Indigo/Coles, which controls 70 percent of Canada’s retail book trade. The Harper government is plowing full steam ahead with its support for Israel. Double standards and morality be damned.